For a long time, after I found him I thought my Great Grandfather Alfred Bass had just dropped from heaven one day and landed at age twenty-five in Union Parish, Louisiana, Marion township. The first place I ever saw him was in the 1870 census Union Ward 2. There, he came alive for me, like a photograph of a moment, of life captured in a frame, in which the periphery is missing, and I longed to see the whole picture. I wanted to know more about this farmer born 1845 who was head-of-household to Silva (nee Lee) born 1845 and Wiley a child born in 1869. Sometimes, if you listen like I have you can hear their voices, in the silence, when the darkness of night swallows the moon, and the stars, give no light. Their voices urge you to remember a memory you never lived, their spirits nudge you to search for that light at tunnels-end, that they never found. Dig deeper in the darkness they say, it’s there keep looking. Although, when I search back ten years to 1860 neither Alfred Bass nor Silva Lee are enumerated as free people which let me know they were yet slaves. In 1870, there were only two other obvious families with the surname Bass, in Marion. Jacob Bass born 1810 a black man (according to 1870 census born in South Carolina, in the1880 census it reads North Carolina) head of household to seven other people. Was he Alfred’s father? 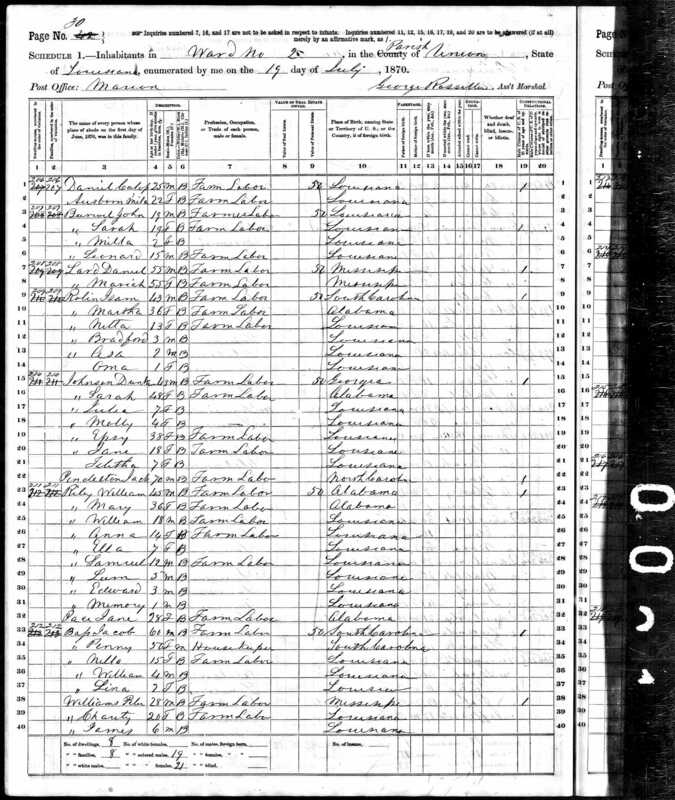 Uriah Bass enumerated as white head-of-household to five others born 1806 in North Carolina. Were either of them related? There were others who lived in close proximity to Union Parish too, that urged me to spend some time. Such as Dock Bass born 1825 in Alabama who lived in Farmerville in 1870, the parish seat of Union Parish (in 1880 Alfred Bass reports his father was from Alabama and mother from Georgia) or Henry Bass who lived in Ouachita a division of Union Parish. Dock voted in the first election that blacks were allowed to vote. Then there was John Bass who drowned at age 14 in Ouachita Parish listed in the Mortality Schedules, and until I know differently, I claim them all, and will keep their memory alive as a posthumous promise. 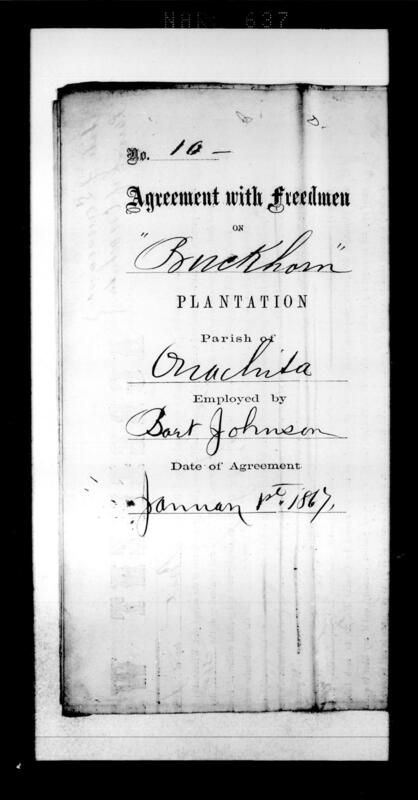 This year a friend on Facebook sent me a labor contract made in 1867, which my great-grandfather is enumerated as one of the employees in a group of sixty-nine others employed by Bart Johnson of Buckhorn Plantation, Ouachita Parish. 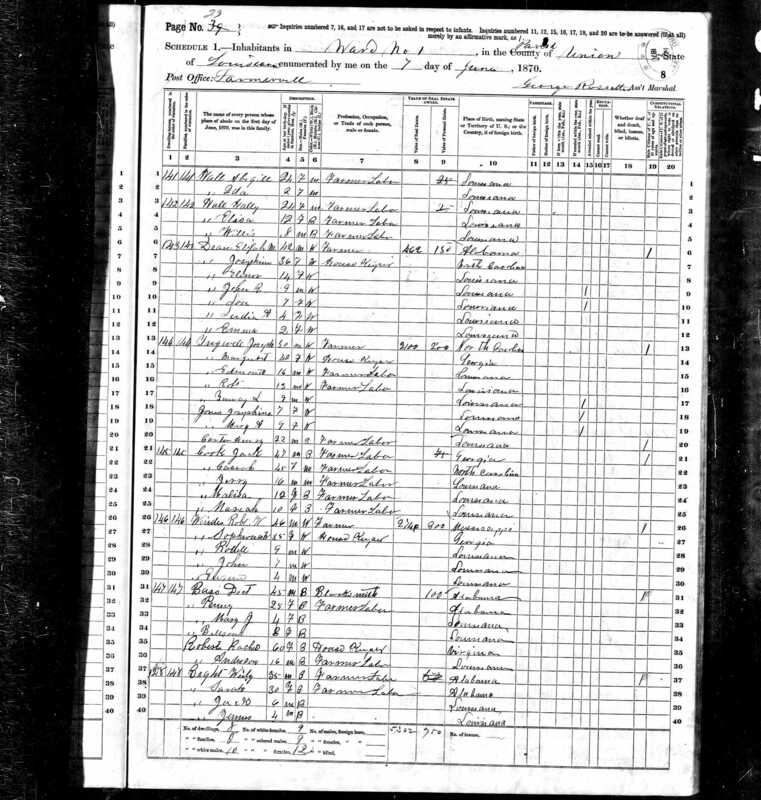 He is listed amongst some familiar names from the 1870 census including Jacob Bass! I could almost see great-grandpa Alfred smile! 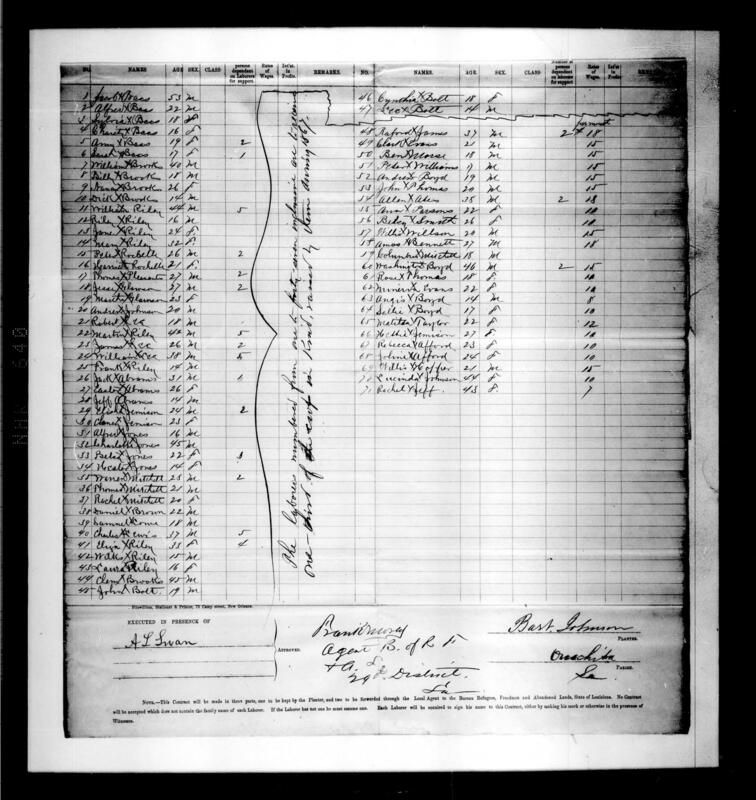 Another name listed on this labor contract was Peter Rochelle who was a former slave owned by Nancy Harrison Rochelle, wife of Anderson Rochelle and in whose will Peter Rochelle is mentioned. Nancy is the grandmother of Mary W. Ross-Mims, wife of Seaborn David Mims, Nancy Rochelle’s daughter, Sarah Rochelle-Ross married first James Ross who died in 1849 then later she married Elias George the widow of Molsey Ann Bass who migrated to Union Parish from Perry Alabama in 1848. 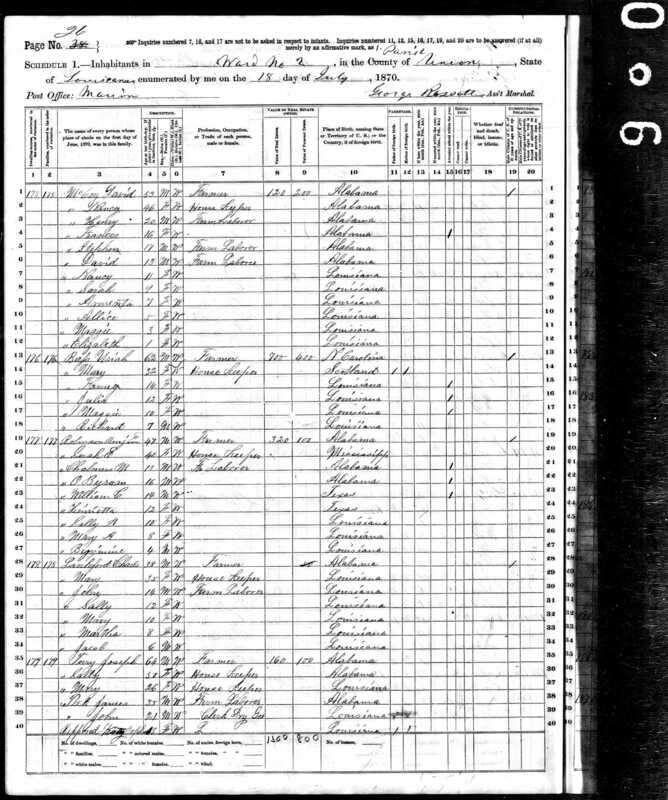 It is in the sucession records of Mary W. Ross-Mims that my great grandfather Alfred is named. This entry was posted in Griot Gram.